Its my MIL's recipe. Its a simple and easy recipe. Cumin is good for digestive system. As the name implies in Tamil (சீர் +அகம் = சீரகம்) it regulates the digestive system when we include it in our diet regularly. Soak the tamarind in water for 15 minutes and extract the juice. Heat oil in a pan, add mustard seeds ,Fenugreek seeds and curry leaves.Once splutter add garlic and fry for few minutes. Add onion and cook till it translucent and add tomato,salt and turmeric powder. 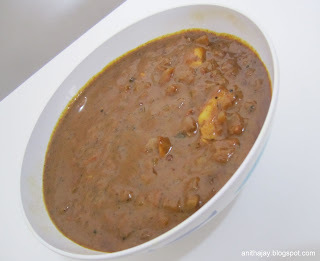 Add sambar powder,Tamarind extract and some water(According to gravy thickness.) Mix well and let it boil. Mean while try roast the cumin seeds till you get the nice aroma and grind it. Add the cumin powder at the end , cook for 2 -3 minutes and switch off the flame. Use of sesame oil will enhance the taste. Fingerlicking healthy and flavourful kuzhambu.